We’d love your help. Let us know what’s wrong with this preview of Love, Vampire Style by Toni V. Sweeney. To ask other readers questions about Love, Vampire Style, please sign up. Though Love Vampire Style is just a small bite of a story, it’s a good bite, and, with a great main character and a savory love story, it’s well worth your time to read. 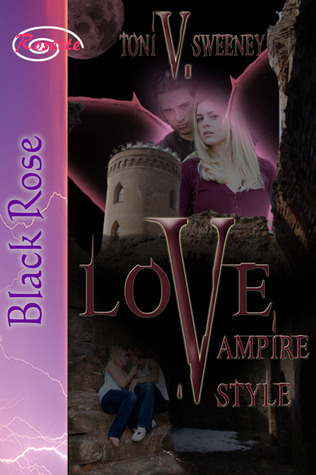 Love, Vamp Though Love Vampire Style is just a small bite of a story, it’s a good bite, and, with a great main character and a savory love story, it’s well worth your time to read. If you like vampires, brooding heroes, and romance, you'll enjoy this fun, fast read. Ms. Sweeney writes (and obeys) her own rules for vampires in this unique love story. Toni V. Sweeney specializes in SF/fantasy stories, though she has written in other genres as well. Her western novels NEBRASKA: Walk the Shadow Trail placed 1st in Historical Romance at the 2015 Paranormal Guild's Reviewers Choice awards and 2nd in Other Novels at the Preditors & Editors Readers Poll; NEBRASKA: Vengeance from Eden was a Top 10 finisher in the 2014 Preditors & Editors Reade Toni V. Sweeney specializes in SF/fantasy stories, though she has written in other genres as well. Her western novels NEBRASKA: Walk the Shadow Trail placed 1st in Historical Romance at the 2015 Paranormal Guild's Reviewers Choice awards and 2nd in Other Novels at the Preditors & Editors Readers Poll; NEBRASKA: Vengeance from Eden was a Top 10 finisher in the 2014 Preditors & Editors Readers Poll. She also placed in the Top 10 Authors for 2015 from that same poll. In 2014, TUESDAY'S CHILD (by Icy Snow Blackstone) won 1st in Contemporary Romance at the Paranormal Romance Guild's Reviewer's Choice awards. THE EARTHMAN'S BRIDE (writing as Icy Snow Blackstone), re-released by Class Act Books in May, 2012, placed first in Alternate Romance/SF Division in the Maryland Romance Writer's Contest "Reveal Your Inner Vixen in 2008. JERICHO ROAD (also authored as Icy Snow Blackstone), placed 7th in the National Writers Association's Novel Contest in 1997. Under her own name, Toni writes SciFi/fantasy and space opera and the occasional horror and romance novel. Writing as Icy Snow Blackstone, she authors romance novels. She is currently promotion manager for Class Act Books. She has reviewed books for 2 Lips reviews and at present is on the review staff of the New York Journal of Books and the Paranormal Romance Guild. She was recently named a professional reader by netgalley.com. Her trailers are featured on Youtube.com.